We are pleased to inform that SME Association of South Johor (SMEJS) and Universiti Tunku Abdul Rahman (UTAR) will be having a MOU signing ceremony on 22th January 2016. The purpose of the MOU signing is for both sides to establish a cooperative relationship, explore more opportunities for cooperation. 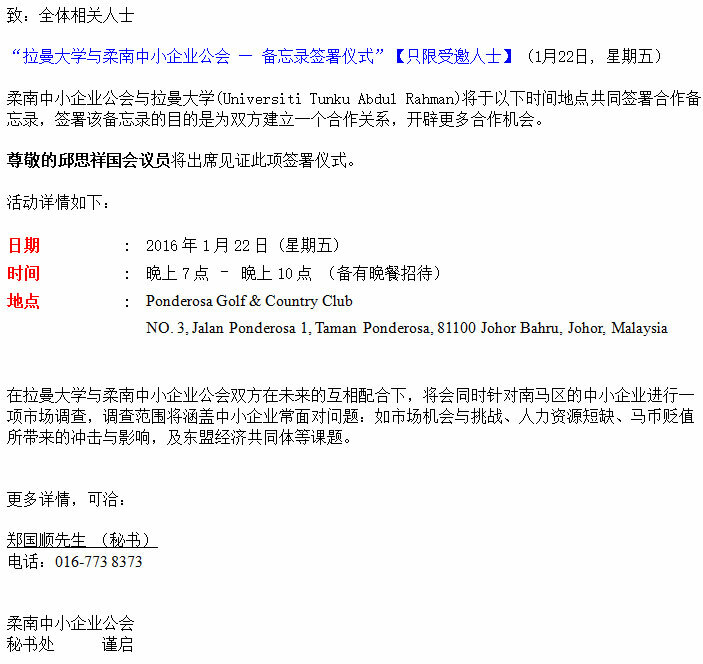 YB Khoo Soo Seang, Member of Paliament for Tebrau is invited as the guest of honor and will be witness the MOU signing. The MOU Signing between SMEJS) and UTAR objective is for both parties to work together to conduct market researches on SME located in southern Malaysia, on issues commonly faces by SME in areas of: Market opportunities and challenges, human resource shortage, ringgit depreciation impact, AEC, etc.